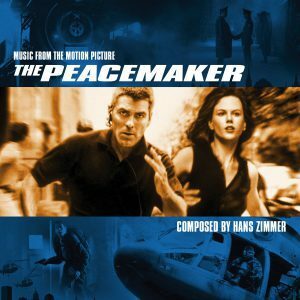 One of my favorite Hans Zimmer scores from the 1990s (aside from The Rock) is, without a doubt, The Peacemaker. The adrenaline-fueled action, dramatic Russian-styled (ala Crimson Tide) choir and emotional melodies just resonated with me for some reason. So it was truly wonderful to be able to tackle the project as a new expanded limited edition. Once we got the DATs from Paramount Pictures transferred, it was straightforward to put the album together. There was only one alternate track available (a different vocal performance), so to fill out the rest of the 2-disc set, we licensed the original 5-track 1997 soundtrack suites, which provide another approach to listening to the music. Buried somewhere in the dusty boxes of my closet, I have some DAT tapes from the late 1990s which contains a bunch of trailer music from various post-production facilities. I knew that one of these DATs contained not only the original Peacemaker trailer music (arranged by Harry Gregson-Williams), but it also had an alternate of John Williams’ Dreamworks SKG logo music (French horn ending, not the traditional guitar ending). I found the DAT, we transferred it, and for at least two passes of the album master, the Dreamworks logo was on the release – but we realized that it might pose a bit of a headache, so we dropped it. I’m still ecstatic that we were able to get the trailer music on the release, though. On the artwork side of things, the biggest difficulty with the album was creating (or, in a sense, re-creating) the cover. Taking the key art and cutting it up into different pieces was the solution, as well as attempting to re-create the 2-tone color shading. It’s not 100% identical to the 1997 soundtrack album, but that’s intentional – that one cropped some of the background imagery a bit too closely for my tastes, and this new cover reflects the poster a bit better.